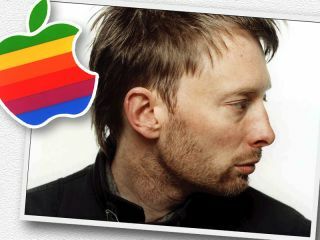 MacLife has voted Radiohead's Thom Yorke into its Top 10 Apple Influencers of 2009 - the "key agents of influence in the ever-growing Applesphere; people to watch, next year and beyond". Thom Yorke's inclusion in the list (which also includes such Apple luminaries as iPod and MacBook designer Jonathan Ives) means the Radiohead frontman is seen to "help build public perception of what Apple 'is' as a cultural force". 1. Radiohead and producer Nigel Godrich use a Mac-based set-up to record their albums, as this interview testifies. We also learn (though it wasn't really a secret) that Thom's laptop of choice is indeed a Mac. 2. Radiohead love a bit of Logic. Check the same interview - Apple's Logic DAW is "almost too powerful" says Godrich. 3. Thom Yorke wrote his electronica record The Eraser on his laptop - therefore, on a Mac. 4. Radiohead love a bit of live Mac action, too. As we revealed earlier in the year, the band's live shows are powered by several MacBooks/iBooks/PowerBooks running NI's Kontakt and Reaktor, Max/MSP and more. 5. Most importantly of all, Thom Yorke has an Apple logo sticker (specifically the '76 - '98 rainbow one) on his black Fender Tele. As delighted as we are that a musician has been voted into the list, here at MusicRadar we're still left with a question on our lips: what about Jonny Greenwood? After all, Jonny is just as responsible as Thom Yorke for the brilliant Mac-based beats, groans, chirps and squeaks that adorn Radiohead's albums. The guitarist also scored the Oscar-winning film There Will Be Blood and is composer-in-residence at the BBC. Surely he uses a Mac for these extra-curricular excursions, too? In the end, we suspect that poor old Jonny just isn't famous enough to be considered a key Apple Influencer. If MusicRadar was writing the list, however, every member of Radiohead would appear in the Top 10.